This is the second in a series of three posts that reflect on the plethora of large and small factors—revealed during a casual panel discussion at the 2018 IA Global Summit—that should be considered when working across borders in Asia-Pacific. Here we focus on Activity-based Working. Background: In Seattle earlier this year, IA hosted four of its ASIA PACIFIC (APAC) IA Global partners at the 2018 IA Global Summit. With a network of partner affiliates in Europe, Middle East and Africa, Asia and Australia, Canada, and Latin America, IA Global leverages IA’s 30+ years of working worldwide with proven local expertise that understands cultural differences, local compliance requirements, and can easily navigate the unique aspects of regional architecture and construction. We work directly with our global partners, to fine-tune best practices and communication as well as cross-border collaboration, and global summits allow us to maintain a high-performing, international project capability. On day one of the 2018 summit, IA Director of Strategy James Truhan joined with alliance members from India, Australia, Singapore and Japan to identify the risks, focuses, and potential challenges that should be understood when working across APAC regions. Here we look at alternative work styles across APAC. Sapient. Photography © Tom Arban. Activity-based Working Explained: Activity-based Working, (ABW), is a workplace model that provides a curated range of settings to accommodate a range of workstyles. Properly implemented and supported, ABW allows staff the discretion to choose the work environment that best works for them based on their needs at the moment. Used in conjunction with free-address polices and mobile technology, significantly higher building capacities can be achieved, driven by higher staff per seat ratios than the traditional one person/one seat model. Thus, for a given staff population, less building area is required, making it attractive as a cost savings platform. While ABW and desk sharing can work for many organizations, those seeking to adopt it purely for cost reduction and efficiency measures will be missing an important opportunity to promote employee experience and engagement. Autodesk. Photography © Ben Rahn/A-Frame. Notwithstanding the benefits, adopting ABW requires a substantial shift by staff to adjust to less “me” space and much more “we” space in the workplace. For management, traditional “line of sight” management practices have to give way to managing by output and deliverables, since the organization’s people might now be distributed throughout one or more floors or buildings. Finally, ABW and desk sharing can have secondary but critical infrastructure implications. As a case in point, if the building’s elevator capacity is 300 people, based on a one seat to one employee scenario, but the building now serves 500-600 staff, wait times can significantly increase. Although there is growing interest and movement toward ABW, traditional one person/one seat allocation models are still dominant. However, ABW adoption is accelerating at tech companies as a means of obtaining more capacity without adding more workstations in buildings where workstation densities are already quite high. 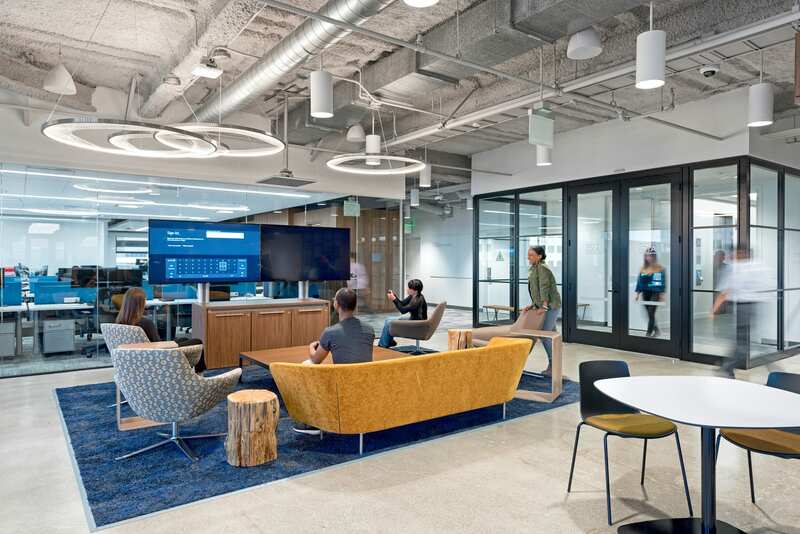 Given the very large floor plates common in areas such as Bangalore, tech companies are increasingly leveraging reservation systems to streamline staff’s ability to locate open seats. With these systems, users simply swipe a card and are directed to a seat. Once logged-in, phone and any additional ancillary tools are ready to use. India has emerged as a growing market enjoying a construction boom that extends to all sectors of the economy, although demand is exceeding supply. Builders are not able to build fast enough and businesses occupy the space even before construction is complete. 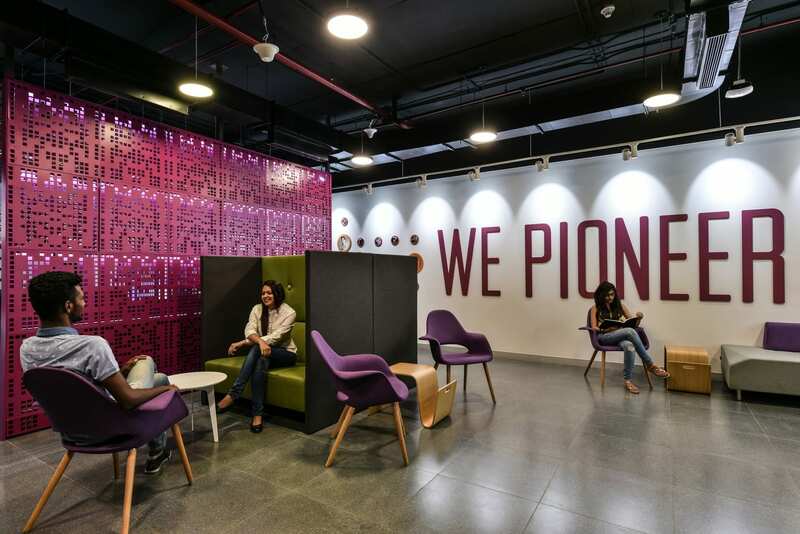 With more large companies from Europe and the West competing for talent in India, there is a greater understanding than ever before of the power of design and the workplace experience to retain and recruit staff. 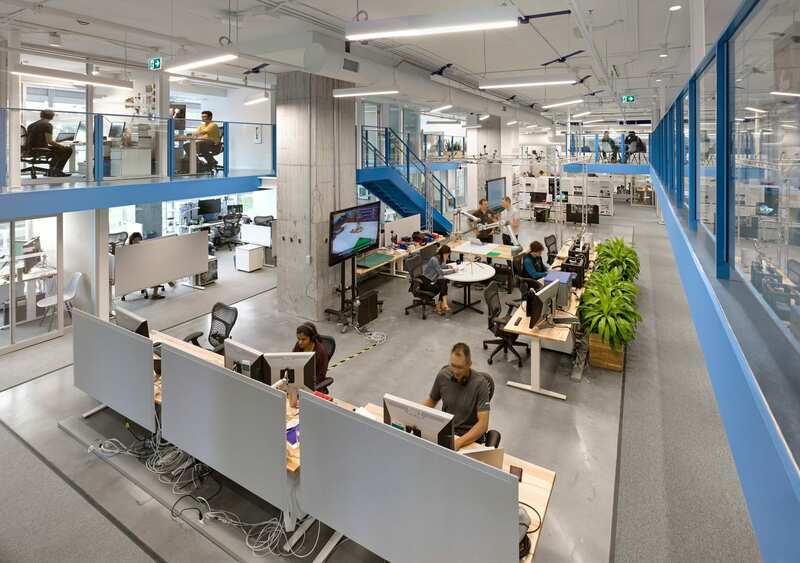 Interestingly, Japanese companies in India, once reluctant to spend on design, have seen what European and American based corporations are demanding for their facilities and the impact it has had on recruiting. As a result, they now want to use the design firms that are doing work for western companies. Confidential Client. Photography © Prashant Bhat. In Asia, the culture retains the traditional expectation that seniority conveys entitlement to a window or corner office. Breaking free of that thinking is a challenge, and there is resistance, bolstered by the belief that if you don’t have an assigned desk, your job is potentially at risk. Nevertheless, there is substantial interest in ABW and desk sharing as a platform to increase building capacity and thereby reduce costs. In addition, there is significant competition for talent and a increasing awareness that things need to be done differently. The concept of wellbeing is growing in importance, although the Well standard used in North America is not widely known in Asia. There is a concern to mitigate the consumption of electricity as well as lead, but they don’t know how to do it, and strategy and change management is a service few can provide in Asia. There is obviously opportunity here. When considering wellbeing, the idea of work-life balance, which is really just about balance, is gaining ground. 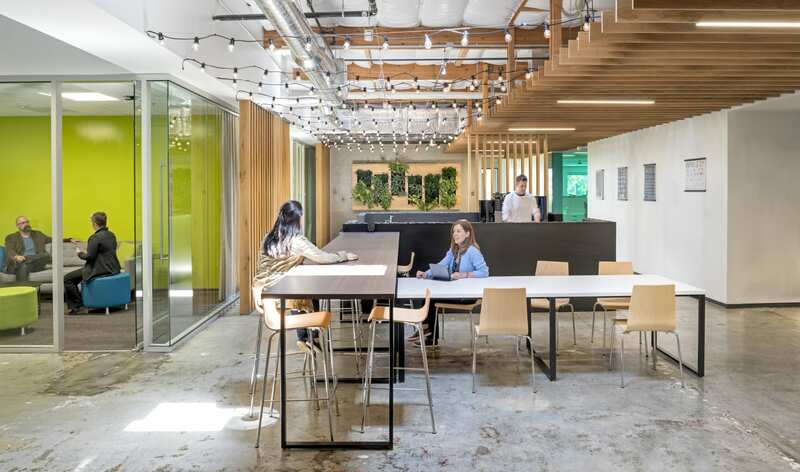 The assumption that the workplace only has to support productivity and provide a few amenities is no longer valid; a workplace can actually improve quality of life. Think about the air quality in China; because it is so poor, a workplace with a highly thought out indoor air quality is actually a respite for employees. AIG. Photography © Jasper Sanidad Photography. Limited transition to ABW is underway, but if it is to work for more companies, employees have to feel that they have a “home base” somewhere in the office. Re-thinking hierarchy and robust change management support are essential in Japan’s tradition-bound business culture. ABW and desk sharing models have been in use in Australia for the last 15 years, and today it is the default approach to the workplace. Inasmuch as Australia and North America are similar culturally, Australian ABW practices can be used as reasonable test cases for our market. Australia, by virtue of its willingness to push the practice envelope has become a giant workplace laboratory. For example, one of the large Australian banks, an early adopter of ABW, continues to pursue new, innovative models. Currently it is considering a “tribal” model, wherein over 150 groups, consisting of about 2,000 of its 12,000 employees, will be divided into tribes of 15 staff each. The intent is to foster agility and innovation at a small group scale and encourage the tribes to work together. Is this a bit of a flip from an ABW model? Yes, but it’s absolutely in line with the Australian willingness to innovate at scale, which is propelled by the country’s culture that minimizes hierarchy. Here, the corner office is not an object of entitlement and workers are much more tolerant. As a result, different models and opportunities can be pursued in a very progressive environment. As well as being an early adopter of alternative work models, Australia has embraced wellness in a big way, partially driven by its heavily regulated design and construction market. Confidential Client. Photography © Jaspar Sanidad Photography. With increased globalization, culture-specific work preferences, traditions, and workplace models in APAC are converging on a universal workplace language, driven by tech and demographic disruptions that are being felt everywhere. This convergence, while occurring at relatively different speeds, is moving in pursuit of the same goals regardless of geography: efficiency, combined with the imperative to attract and retain talent. Want to know more? The next post will discuss, augmented reality, Revit, artificial intelligence, one-on-one communication, and other topics related to creating innovative work environments across boundaries in APAC. Then click below to learn some of the insights our APAC partners were able to provide in areas like Australia, India, Japan, and more. More great IA Thought Leadership from the Asia Pacific region.